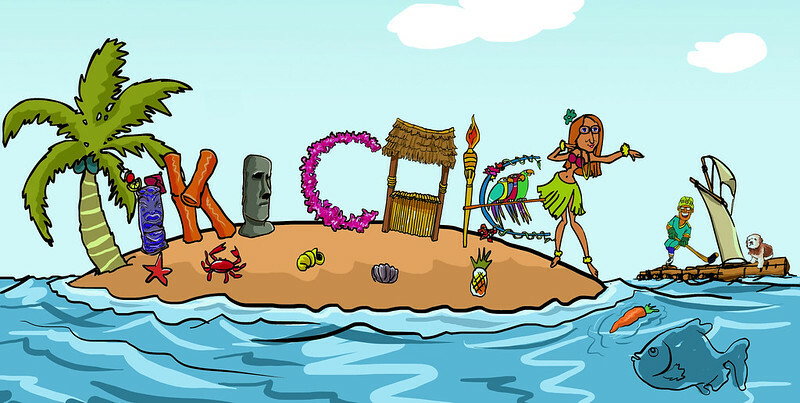 Check Out the New Logo for The Tiki Chick! As a Valentine’s Day gift, my dear Mr. Hockey surprised me with a logo for The Tiki Chick blog, which is something he’s talked about doing for years. Through Fiver.com he enlisted a cartoonist to create the final product, but he came up with a complete mock-up with as many tiki references as he could fit in, including a Moai, the Enchanted Tiki Room, and Rufus the carrot-eating fish from Bahooka (the “K” also matches the bamboo font from Bahooka’s sign). Anyway, you can even spot Mr. Hockey and Charlie floating nearby on the Kon-Tiki raft. We have a bunch of business cards with the logo on the way so be sure to ask for one if you see us out and about at a tiki bar! Very nice! And the fact that your honey did that for you is extra cool too! Aloha Tiki Chcik- Love your logo! It rocks! I read the article in the L.A. Times about Rufus. What a shame! I want to thank you for the time and energy you put into your blog. I really appreciate it. I look forward to it every month. Keep the Tiki faith! Mahalo! So glad you enjoy it. Such a romantic Valentine’s Day surprise! Being the owner of Charlie…love that he is a part of that awesome logo!!! hehe, glad you like it!